and River Expeditions in the West! Now in our 41st year! Open for Whitewater Rafting on the Colorado and Green Rivers. River tours operate March through October, land tours operate year-round. Adrift Adventures, located in Moab, Utah invites you for the whitewater rafting vacation of a lifetime on Utah's Colorado and Green Rivers. Join us for an unforgettable whitewater rafting journey through geologic time. You'll find what you want-whether it's unexcelled excitement, quiet serenity, or a bit of both. Based in Moab, Utah, Adrift Adventures features a variety of kayak, jeep and raft vacations in the most rugged and beautiful canyon country of Utah, which includes Canyonlands National Park, the wild Colorado River and Green Rivers, the Fisher Towers and Arches National Park. Ride the whitewater force that created all of this geologic splendor on a river trip through the renowned Cataract Canyon of the Colorado River, or the scenic Desolation Canyon of the Green River. 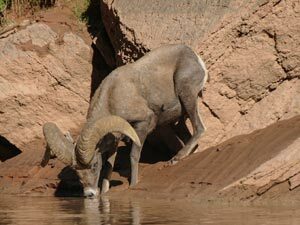 Or step aboard our powerful Jet boat to explore the river canyons between Moab and Canyonlands National Park. If overland 4x4 adventures are more to your taste, let our skilled, professional guides take you on a jeep tour, Paddle Boarding (SUP) or Sea Kayak tours through the little-known magnificent Landscapes of Canyonlands. 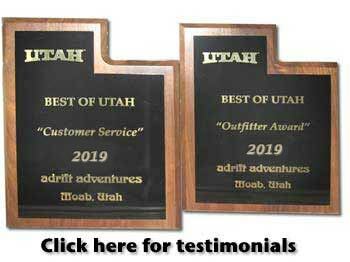 Adrift Adventures offers the finest whitewater outfitting and equipment in the Moab area. Whether you are r iding in a raft or jeeping in a four-wheel drive vehicle, you can be assured all of our facilities and equipment are designed to afford you the most enjoyable experience possible. Our food is the finest on the river. Menus feature juicy steaks, halibut or salmon, chicken, fresh salads, melons, lasagna and more. We can also prepare low-fat/low cholesterol, gluten-free and vegetarian menus for those who prefer. Let our licensed and experienced guides take you on a vacation you'll reminisce about for years. 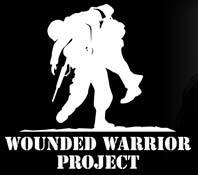 Click Here for links to our friends' websites! Reserve your whitewater rafting trip today for the Colorado or Green Rivers. Explore our site and see why Adrift Adventures is the place to go for your Moab, Utah whitewater rafting vacation. Enjoy Utah's absolute best whitewater rafting!